A new report provides an updated and detailed picture for how climate change is affecting this crucial source of freshwater and, therefore, threatening public health, infrastructure, fish and wildlife, and the regional economy. More than a dozen leading scientists and experts—including Northwestern University's Aaron Packman—from Midwestern and Canadian universities and research institutions released the comprehensive report today (March 22). "We are already seeing the effects of climate change on Great Lakes cities," Packman said. "One example is the recent severe flooding, which is associated with changing weather patterns in the winter and early spring." An expert in water scarcity, water management and urban flooding, Packman is a professor of civil and environmental engineering in Northwestern's McCormick School of Engineering and director of the Northwestern Center for Water Research. 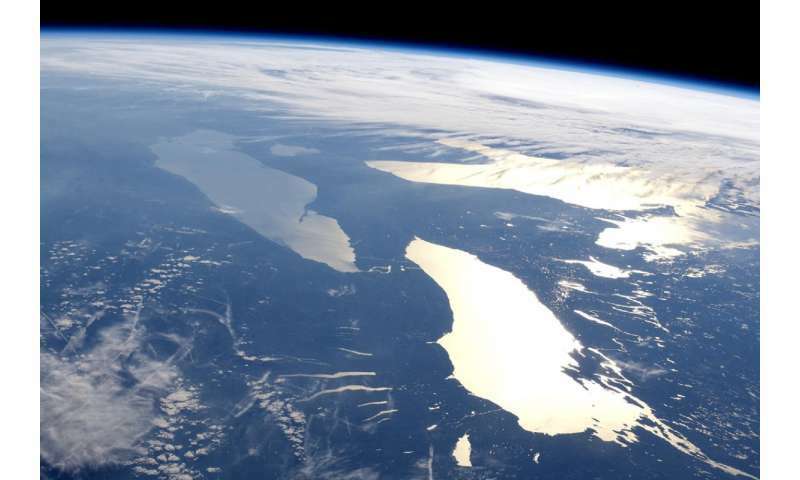 "Over the last two centuries, the Great Lakes have been impacted by human activity, and climate change is now adding more challenges and another layer of stress," said Don Wuebbles, who led the study. "This report paints a stark picture of changes in store for the lakes as a result of our changing climate." The report highlights wide-ranging impacts, including weather changes, water quality, ecology, infrastructure, public health, land value and economics. Industries as far reaching as agriculture, tourism, transportation and shipping could be affected. Lower quality of drinking water: Warming trends have already increased bacteria levels in the lakes, and changes to the lakes' ecosystems will increase the number and severity of algae blooms which leave water unsafe to drink. Both bacteria and algae blooms dramatically increase the costs of water treatment, and can make water unsafe for swimming. Agricultural losses: Changes in seasonal precipitation are already affecting farmers in Midwestern states, with planting delays caused by spring flooding and excessively wet soil. Delayed planting puts crops at greater risk during hotter and drier conditions later in the growing season. This increases the demand for irrigation to mitigate crop losses. Even with increased water management, it is projected that crop yields for both soybean and corn will decrease by 10%-30% by the end of the century. Deteriorating coast lines: Beaches, dunes and shorelines will be more vulnerable to coastal erosion as a result of changing weather patterns and the increased incidence of severe storm events. Packman's laboratory has long been committed to searching for new solutions to the ominous effects of climate change. "Northwestern, Argonne National Laboratory, University of Illinois and other partners are examining the vulnerability of Chicago to extreme weather," he said. "We are working together to explore solutions that will make our urban communities more resilient." With funding from the National Science Foundation, Packman leads a multidisciplinary team from Northwestern, University of Illinois and Argonne called Systems Approaches for Vulnerability Evaluation and Urban Resilience (SAVEUR). The project combines national science, social science, data science and engineering to more accurately predict extreme events, such as heat waves, air quality and flooding as well as assess vulnerabilities within neighborhoods. The research will help inform proposed infrastructure changes that are sustainable and adaptive. "The project will provide assessments of the likelihood of extreme weather impacts in neighborhoods across the city, which can be used to direct resources to help those most at risk," Packman said. "The project will also identify how green infrastructure such as parks, gardens and nature preserves can be used by local communities to reduce their vulnerability to extreme weather."